I visited the KG main campus over in Kobe for the first time this Saturday. The business manager, office manager, campus supervisor, SIS head, and I, went for a meeting of the KG Council. The Council is an appointed group that provides support and a check for the KG Board of Trustees. 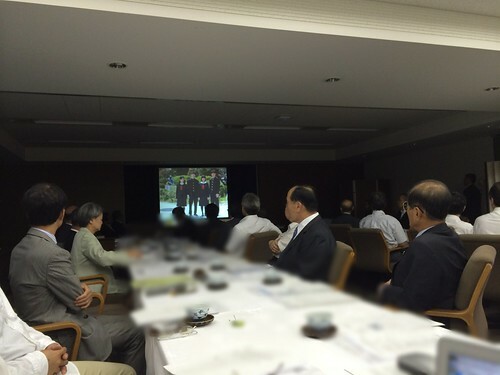 I counted about 45 people at the meeting, which took place in the administration building. My first impression of the campus was “California” and I learned that it was inspired by Stanford University of Palo Alto, California. The Spanish colonial style buildings, tall palm trees, and green mountain backdrop make it a gorgeous scene. The opening speech by BoT Chair, and former Fuji Film Executive, Akira Miyhara, was well received by those in attendance. He stressed the fact that change comes rapidly to societies, using the example that his former business, photographic film, completely changed with the advent of digital technology. He also mentioned the importance of getting more women into the workforce, something that Prime Minister Abe has also said. I counted only 4 women at the meeting. He went on to encourage the KG schools to produce students that can adapt to change and encourage female students to think about their careers. The most interesting part of the meeting for me was to hear from the other heads of schools. The KG Foundation has schools from Kindergarten (Early Childhood) all the way through post graduate studies. They value all of the them and the Heads from several schools gave presentations of what is going on at each of the schools at the meeting. The first was the Seiwa Junior College , which is similar to a community college or TAFE (Australia) and they have two-year and vocational programs. 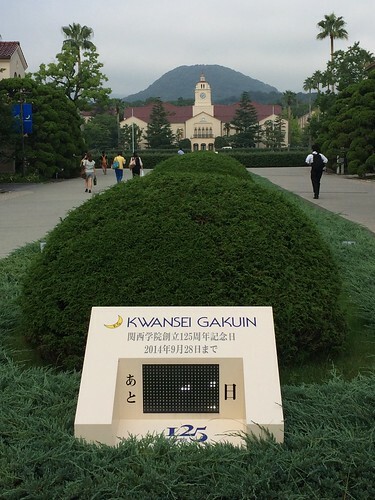 The Kwansei Gakuin Junior High School reported having double the number of applicants for the spaces available in the school. The girls are scoring higher than boys, which I find common at this phase of early adolescence. They now have 3 native English speakers on staff. The Kwansei Gakuin Elementary School had a graduation trip to Vancouver, British Columbia. The Head of the Izawa Seiwa Kindergarten did an interesting study of how many steps children take per day. Children are walking much less than when he did the studies in the past. The average dropped from 30,000 steps 10 years ago to around 3,000 today. The school is focusing on ways to get kids walking more often. The school also grows around 1,000 sweet potatoes yearly on campus and sells them to the cafeteria at KG university and to their community. This year the harvest was much less due to the heavy rains. The next Council meeting will be in December and Masago Sensei, head of SIS and I will be presenting about what is going on at SOIS. Next Post What are the students learning at OIS?